After a long sabbatical, I’ve returned to my project of walking the length of the river Mersey, from its source to the sea. On the last leg I walked the Goyt valley as far as Marple. Today’s walk of about 6 miles, took me from there to Stockport, where the river Tame joins the Goyt and the river officially becomes the Mersey. Later, I spent some time exploring Stockport, to be the subject of subsequent posts. Driving into Marple, a garage was advertising for sale ‘sandbags – for flood defence’, a reminder of the atrocious summer we’ve been having until a few days ago. 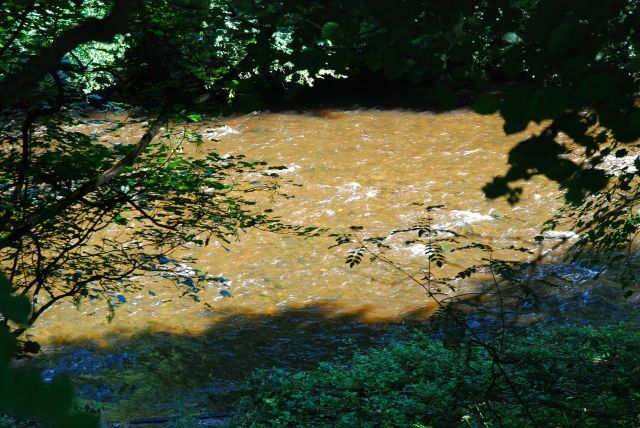 When I reached the Goyt near Marple Dale Hall the river looked entirely different to when I last saw it in the spring last year – now deeper, faster-flowing and richly copper-coloured like a fine brew of tea. And, despite the last few days of dry, warm weather, the riverside path in many places was wet and muddy, occasionally requiring diversions into the undergrowth to escape the mire. In several places along the river, debris from the recent floodwaters still lay stranded against the obstacles that had halted its progress. 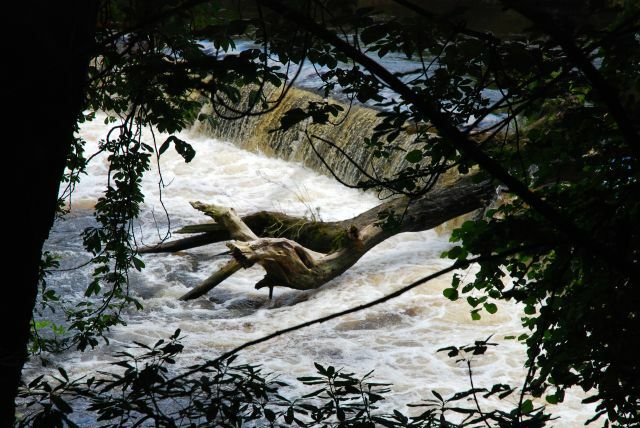 A whole tree, its roots undermined, had collapsed into the river and, swept downstream, had ended up straddled across a weir. Nevertheless, the walk was a pleasant one, through sun-dappled riverside woodland all the way to the centre of Stockport. I had chosen to walk the south bank of the river; if I had followed the Etherow-Goyt Valley Way on the north bank I would have been able to make a small diversion into Chadkirk Country Estate, where a 14th century chapel has been restored by Stockport Council and there are woodland walks, a restored walled garden and a wildflower meadow. 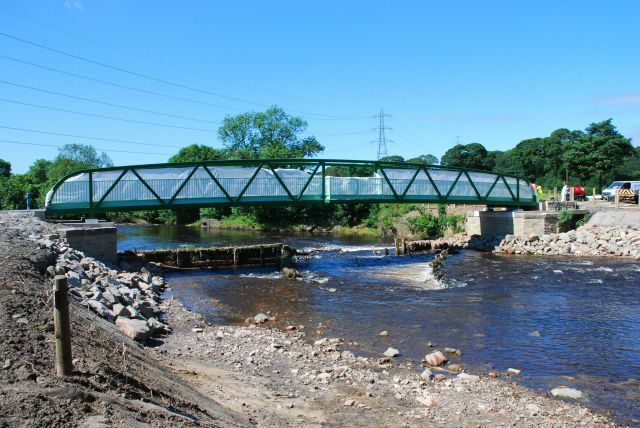 And if I returned next week, I would be able to cross the river at Chadwick, because a new bridge for pedestrians, horse riders and cyclists will be officially opened on Sunday 29 July. 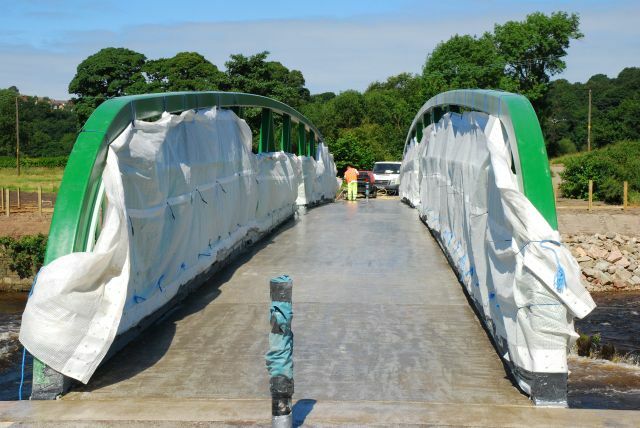 As it was, I encountered the bridge, still in wrappings, and with a team of workmen applying finishing touches to the site. 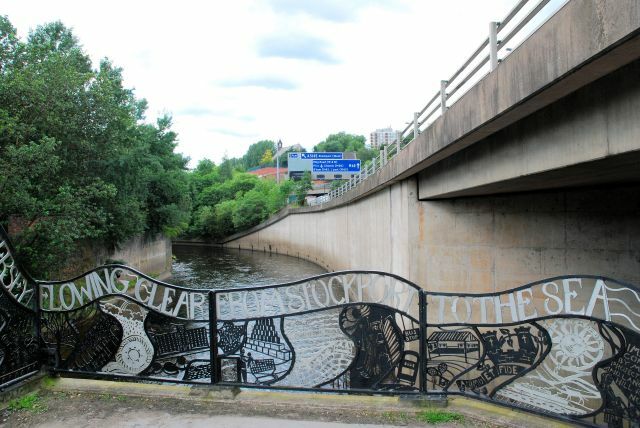 The project has been a partnership between Stockport Council and Sustrans, the charity which builds new walking and cycling routes across the UK. 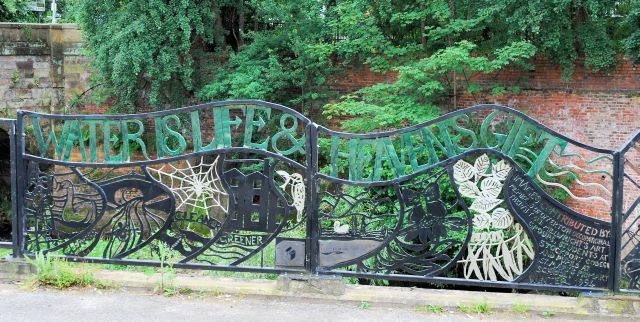 The new bridge will improve community links within Stockport, and connect the Middlewood Way from Marple to Macclesfield with the Trans Pennine Trail. I thought how often we encounter settlements named Newbridge, and how, in the past, a new crossing place like this would almost certainly have sown the seeds of a new community taking advantage of the river crossing. A little further on I came to another bridge, this one, built in 1660 and widened in the 19th century, replaced a much older bridge that marked the northern boundary of Macclesfield Forest. Today the busy A627 thunders over Otterspool bridge, though the view back upriver (above) is a peaceful one. Viewed from the other direction, though, we are definitely in the 21st century. 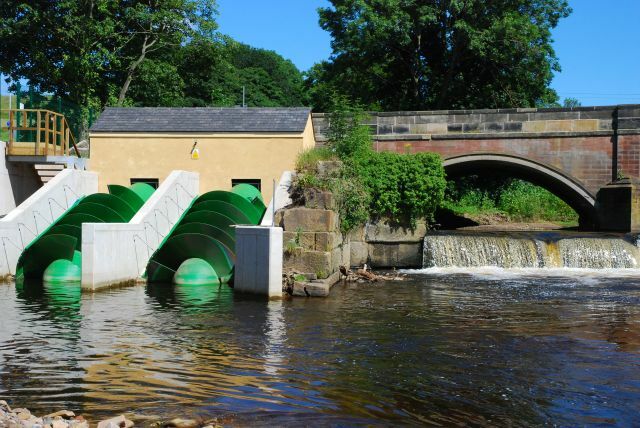 Alongside the weir that once controlled the flow of water to a leat that supplied water to a nearby mill, two massive Archimedean screw turbines have recently been installed. 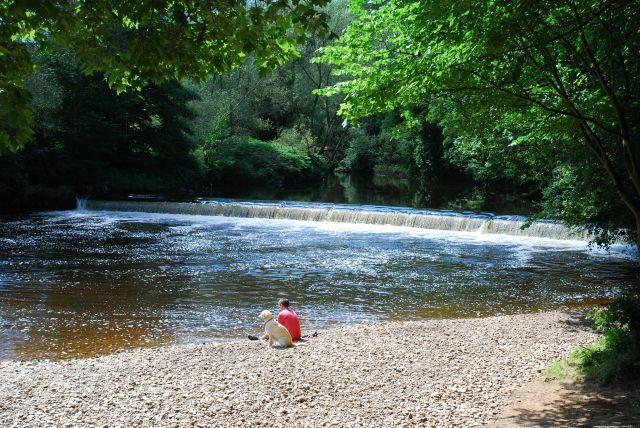 This hydro electric power scheme abstracts water from the Goyt to power generators which convert the water’s mechanical energy into electricity which is then fed into the national grid. Remarkably, this is a community-owned hyrdo-electric project, led by Stockport Council. A community share offer, was supported by a grant from the North West Development Agency and a loan from Charity Bank. The scheme will generate electricity equivalent to that used by about 60 typical homes and save over 100 tonnes of CO2 per year, or over 4,000 tonnes during the estimated 40 year life of the project. The renewable power generated will feed into the national grid and profits will be distributed amongst local community projects. Otterspool: there is at least one other Otterspool along the Mersey – a few miles from my home, on the river shore at Aigburth. These placenames are a reminder that otters once swam in these waters. But, maybe they will return. In 2011 the BBC reported that otters had returned to the Mersey, once one of the most polluted rivers in Europe. The animals’ pawprints were spotted by Forestry Commission rangers by the river near Fiddlers Ferry, though rangers had yet to spot an otter on the riverbank. The animals will only live in clean water so their reappearance was being interpreted as evidence that the Mersey is now less polluted. 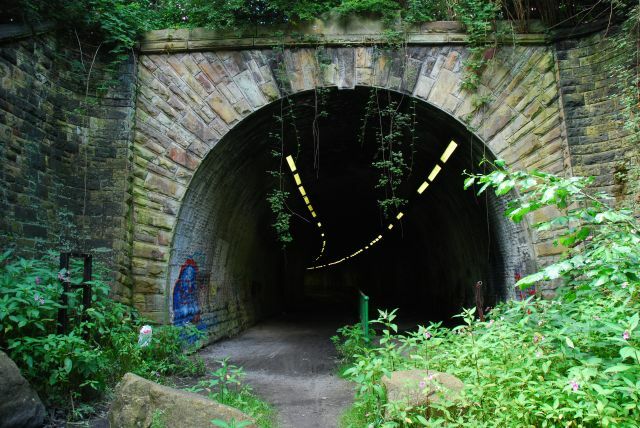 Leaving the river, the path follows Mill Lane, an old sunken lane that once led to the aforementioned mill, before rejoining the Goyt to cross to the other bank via the Jim Fernley Memorial bridge, named in memory of the Etherow Goyt Valley warden from 1979 to 1986. Before dipping down to the river, however, there is a distant view across the fields of a white-domed building, shimmering in the heat-haze like some unlikely northern Taj Mahal. Later I’ll discover what this apparition really is. Apart from the occasional bindweed or cow parsley, for the length of this walk there were few places where dense stands of Himalayan balsam did not dominate the scene (below). 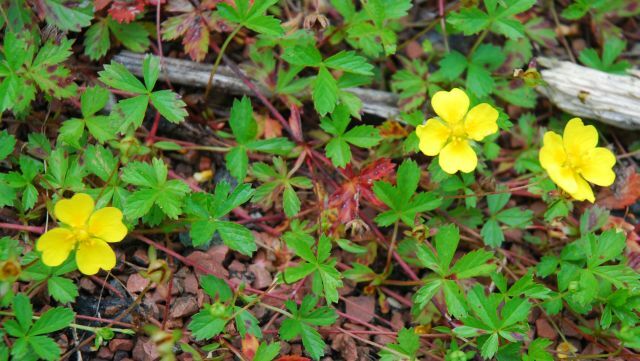 Introduced to Britain in 1839, each plant can produce up to 800 seeds. 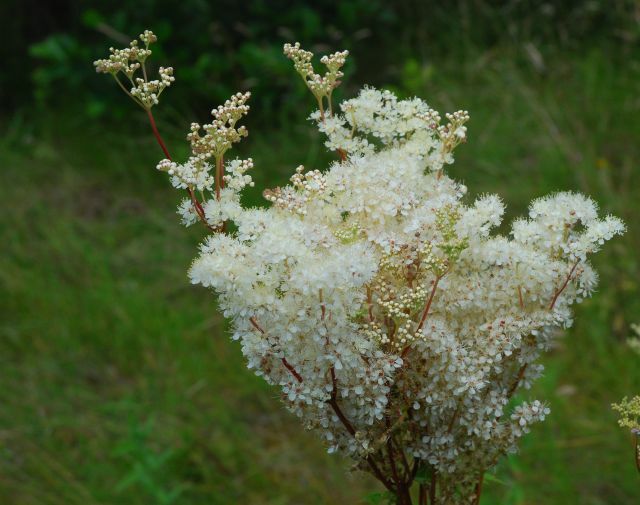 These are dispersed widely as the ripe seedpods can shoot their seeds up to 22 feet away. 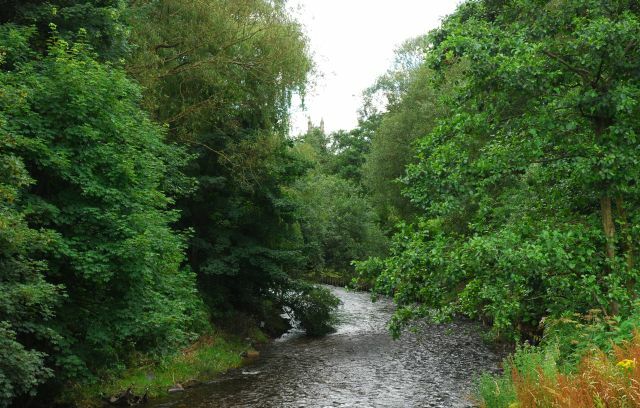 Moreover, once established, as here along the Goyt, in the catchment of a river the seeds, which can remain viable for two years, are transported further afield by water. Himalayan balsam may be beautiful and prolific, attractive to bees and first to colonise the empty mud banks of rivers, but it is reviled for its invasiveness and is accused of shading and squeezing out native varieties (although naturalist Richard Mabey took a different view in his celebration of the plant, broadcast on Radio 4 and still available on the iPlayer). Ironically, they were promoted in the 19th century as having the virtues of ‘herculean proportions’ and ‘splendid invasiveness’, offering ordinary people the opportunity, for the cost of a packet of seeds, to rival the expensive orchids grown in the greenhouses of the rich. 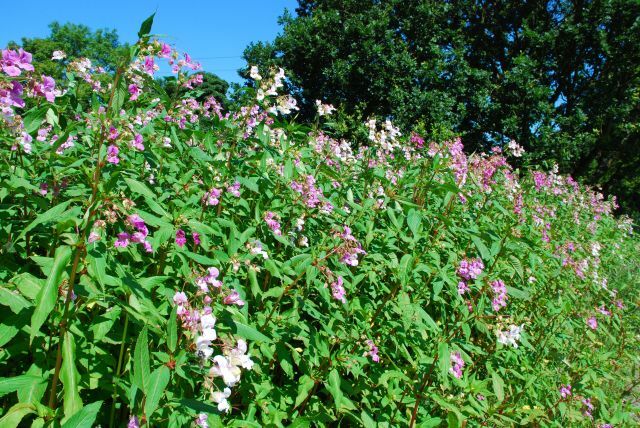 Within ten years, however, Himalayan balsam had escaped from domestic cultivation and had begun to spread along the river systems of England. 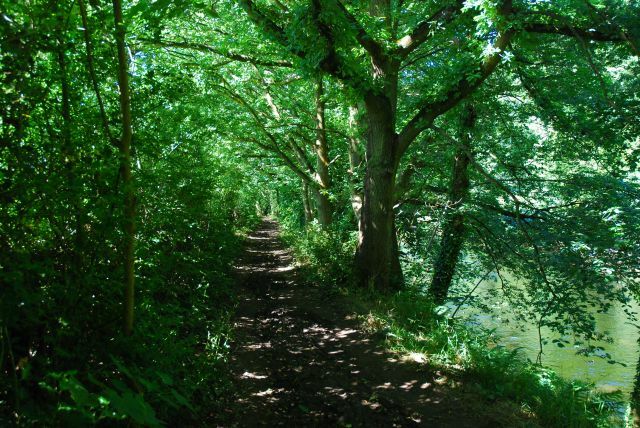 The path soon enters the dense but dappled shade of Poise Brook Local Nature Reserve, an area of ancient woodland officially recognised as a Site of Biological Importance. 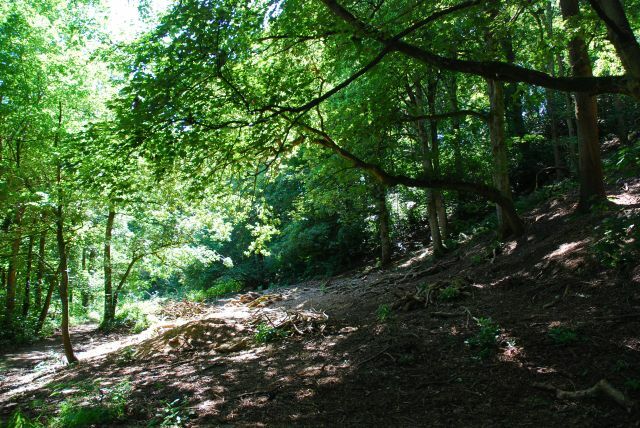 It’s an important habitat for many interesting species of plants, insects and birds. There is the cow parsley look-alike Sweet Cicely, sometimes known as garden myrrh and once a widely cultivated culinary herb strewn on the floors of churches in medieval Britain for its sweet scent – as well as ancient woodland indicators like wood anemone, golden saxifrage, bluebell, yellow archangel, speedwell, and ramsons or wild garlic. Poise Brook, which runs down through Offerton to join the Goyt here, has an interesting geology: over many years the brook has exposed seams and layers of different geological strata, from fine sandstone to coarse gritstone, with layers of stones and gravel deposited by ice movements at the end of the last ice age. The Poynton coal seam (named after the former mining village in Cheshire where I grew up) finishes here below the river level, and fossils of ferns have been regularly found. 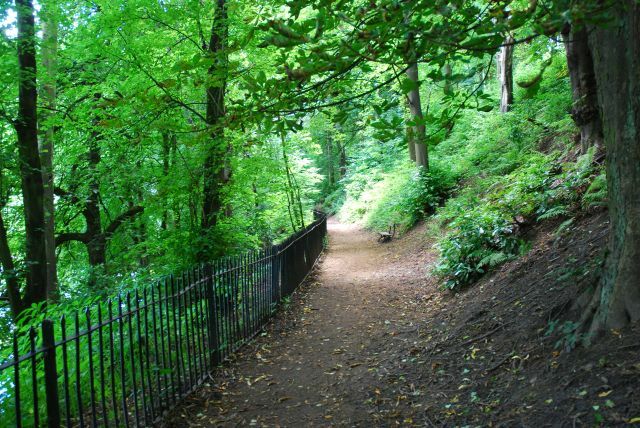 It is difficult to believe, walking the path along this peaceful stretch as it enters Woodbank Memorial Park, that a few strides out of the valley would bring you out into the Stockport suburbs and the busy main road to Marple. 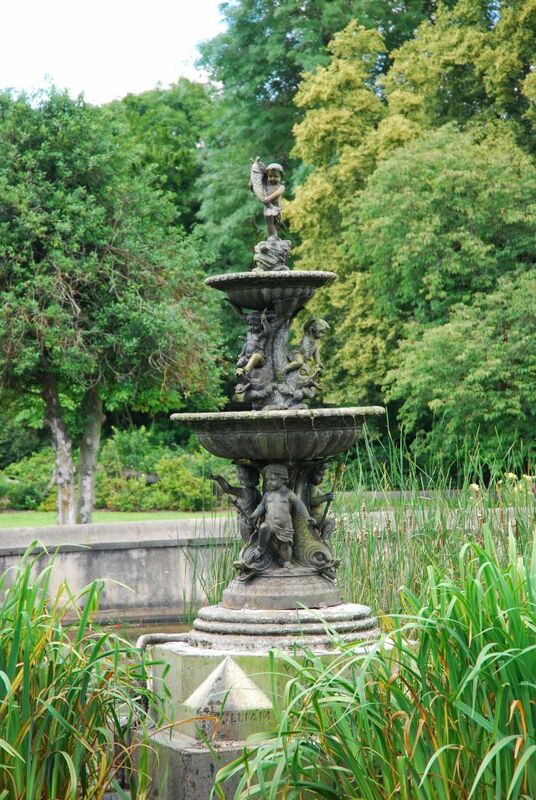 The parkland was presented to Stockport Council in 1921 by Sir Thomas Rowbotham, a former Major of Stockport, in honour of the Stockport men who died in the Great War. 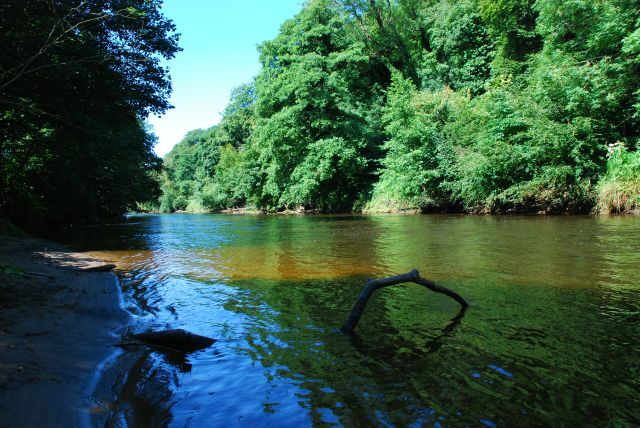 The park is 90 acres in extent, is beautifully wooded and, skirted by the river Goyt, presents striking natural views. The bluebells in the woods are reputedly almost unequalled in any public park in the country. 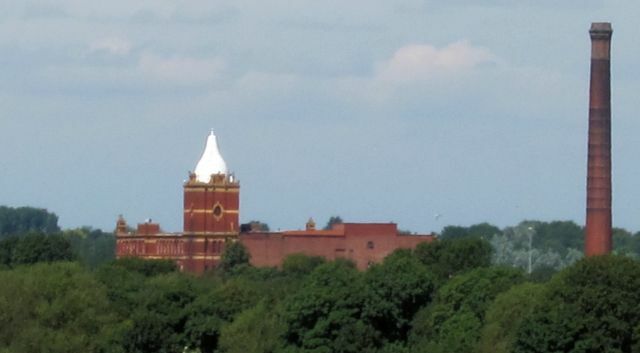 Then, through the trees, I caught glimpses of the white dome and towering edifice I’d seen earlier from across the valley, shimmering in the heat haze. 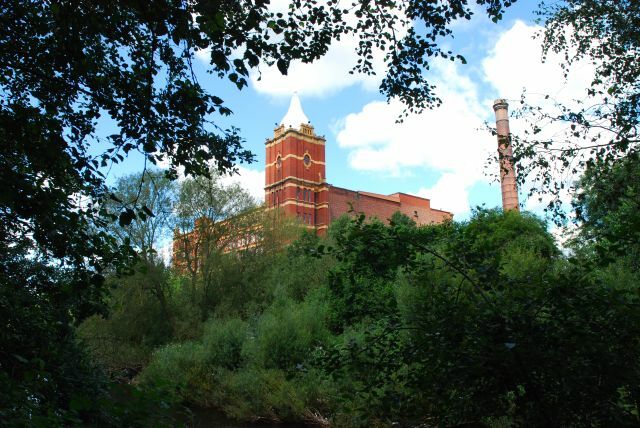 It was revealed as a fine industrial mill – Pear New Mill, one of the last cotton spinning mills built in England. 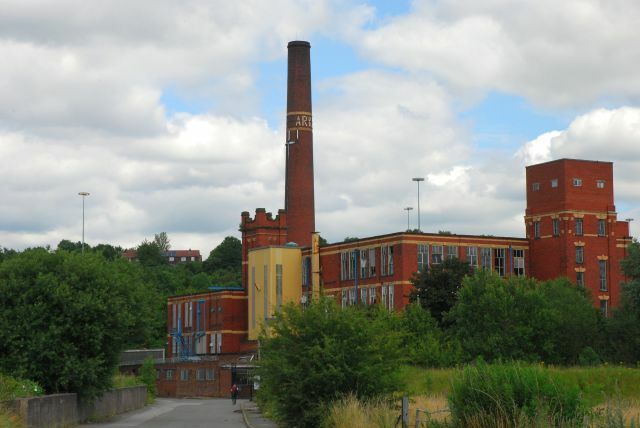 It stands on the northern bank of the Goyt in the Stockport suburb of Bredbury, and is a Grade II listed building. Pear Mill was an Edwardian cotton mill that began production in July 1913. It continued to operate as a textile mill until 1978. 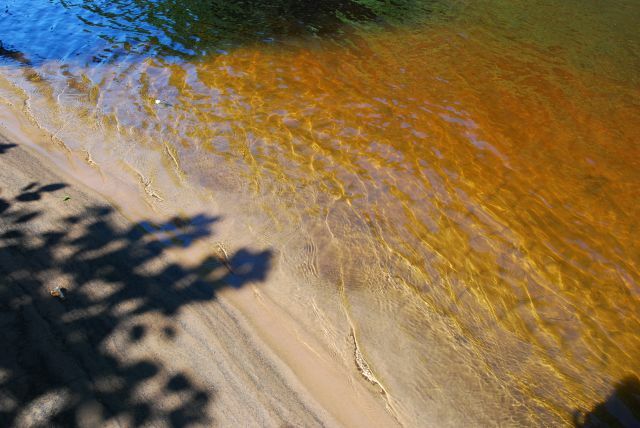 I paused awhile and watched the sun glint on the copper brown water, rippling in the noonday sun. I thought of how crucial this water has been for countless generations on its length: water of life, water of livelihood. From here down to the sea, these rivers were the cradle of the Industrial Revolution, powering mills and machines, replenishing drinking water reserves, serving as sewers and conduits for industrial waste, and as the region’s first effective transportation network. Officially they do not acknowledge this god. In stone buildings with pioneering roofs. In loud, disquieting, oracular tones. Making symbolic gestures at the stream. With a wet rite involving children, rubber, dogs. On Sunday mornings they lustrate the car. Using set litanies: Lovely weather for ducks! Last Thursday we had our summer. Flaming June! (Black comedy is native to this people). Recite on different airways his moods and intentions. The people claim not to believe. But they listen. Their literature is great. They never read it. They reckon these words cover everything. The path becomes broader and more clearly defined as the Goyt nears its rendezvous with the Tame. Before that significant marker, the river winds past Vernon Park, a formal Victorian park opened to the public in 1858. Poynton, township, chapelry, and compact village, situated 5 miles S.S.E. from Stockport, near the Macclesfield branch of the London and North Western Railway, in 1841, contained 152 houses, and 854 inhabitants. Population in 1801, 432 : in 1731, 747. The township comprises upwards of £2,400 acres of good land, and mostly well drained, but its subterranean wealth far exceeds that on the surface. Lord Vernon is the owner and lord of the manor. The Poynton and Worth Coal Mines, the property of, and worked by the Right Hon. George Warren Lord Vernon, are numerous, and spread over a compass of two miles. The coal is of good quality, and the mines are very prolific, having seams of coal varying from 2 to 7 feet in thickness. A railway about a mile in length, on a self acting incline, worked by a wire rope, conveys the coal to the Macclesfield branch railway, which is thence forwarded to Macclesfield and Stockport in very considerable quantities. It is said that the mines were thus discovered :- ‘An old tenant of one of the farms was obliged to procure his water from a considerable distance, and frequently petitioned sir George Warren to sink a well for him; but his request not being attended to, he gave notice to quit the premises. This induced Sir George to pay more deference to the man’s desire, and the well was begun. The spring lay at a great depth : but before they found the water, they discovered a large vein of superior coal’. I wonder what man recompense, if any, that man obtained for his serendipitous demand? 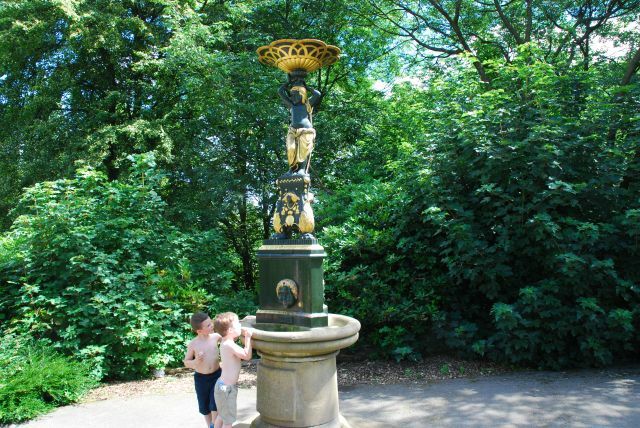 When Vernon Park first opened it was known as Pinch Belly Park or the People’s Park, a reference to the fact that, though the land had been donated by Lord Vernon and the park built by Stockport Corporation, the ornamental fountain (above) and the drinking fountain (below) were donated by local cotton mills which raised the money by collections from their workers. 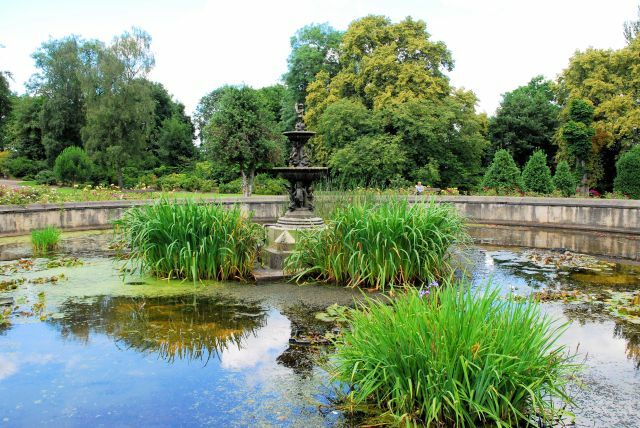 The Lily Pond with its fountain at the centre was an original feature of the park, the fountain at its centre paid for from contributions from the workers of India Mill, a fact recorded on its stone base. Originally the pond would have been powered by a gravity fed water system operating from the Goyt in Woodbank Park. The restored fountain is now powered with electric pumps. The upper part of the cast iron and bronze drinking fountain has been restored, the original having been taken for scrap in 1940 as part of the war effort. Again, it was an original feature of the park, financed by the contributions of workers at Greg’s Mill in Reddish. cannons seated on cast iron garrison carriages. This one, situated outside the Museum at the top of the park, seems to be awaiting a workers’ insurrection at Pear Mill. When I lived in Poynton in the 1960s, Vernon Park was run-down, neglected and shabby. 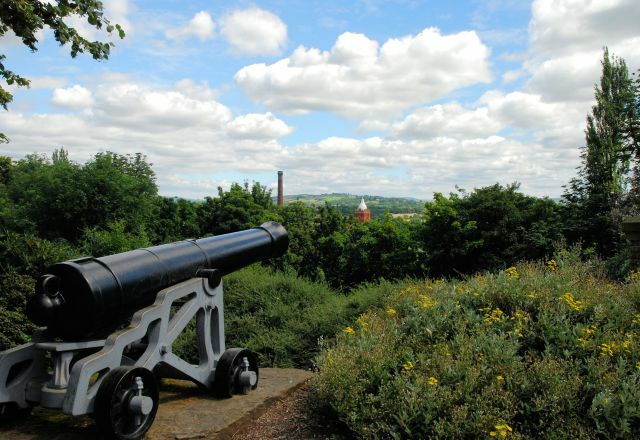 A major project to restore the park was planned during the 1990’s and this restoration was completed in 2000 with funding from the Heritage Lottery Fund. The park is designated Grade II in the English Heritage Register of Historic Parks and Gardens as an important example of an early public park. Leaving Vernon Park, I took a dog leg along the designated Midshires Way, the long-distance footpath across middle England that links the Ridgeway with the Trans Pennine Trail and the Pennine Way, through an area of urban wasteland to where the Way joins the Trans Pennine trail as it comes down to Stockport through Reddish Vale. The purpose of this detour was to arrive at the point where two rivers meet: where the Goyt joins the Tame, and the Mersey begins. 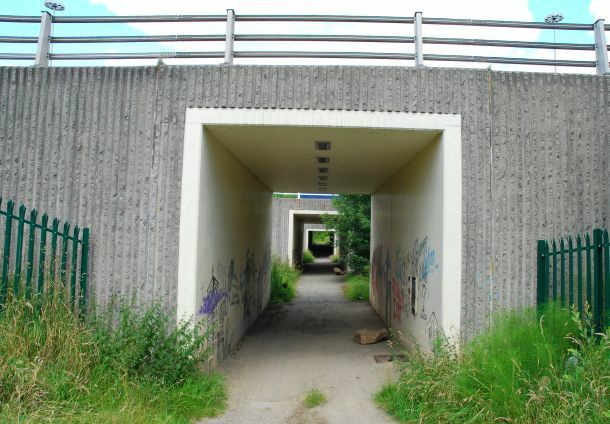 I soon found myself in a perfect example of the sort of urban landscape – the ‘half-rural, half-urban nothingness that surrounds our cities’ – described as ‘edgelands’ by poets Paul Farley and Michael Symmons Roberts in their book Edgelands: Journeys Into England’s True Wilderness. I’ll let their words, in a few extracts from the book, illustrate the photos I took as I traversed this no-man’s land (redolent of ‘the Zone’ in Tarkovsky’s Stalker), with its abandoned railway line, waste ground and unkempt buildings, some derelict others housing marginal trades, through its graffiti-embellished pedestrian underpass beneath the M60 motorway, and its dank and dripping railway tunnel. For a long while – an entire childhood, in fact – we wondered where the countryside actually was, or even if it really existed. Growing up on the edge of two cities – Liverpool and Manchester – in the early Seventies, it was easy enough to walk for a short while and soon find yourself lost in back lanes or waste ground; to follow the wooded perimeters of a golf course; an old path leading through scratchy shrubland, or the course of a drainage ditch. 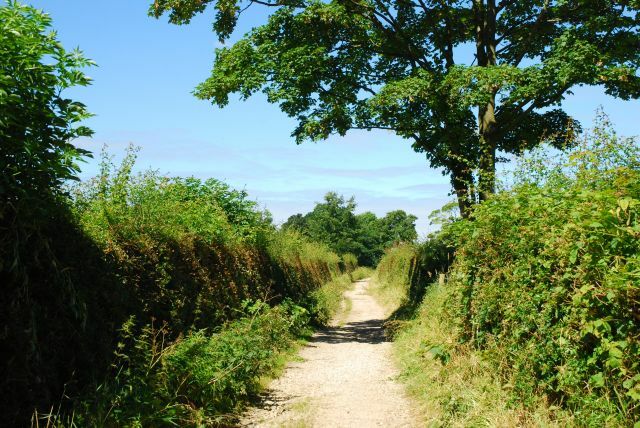 It was easy enough to find yourself on the edges of arable land; to follow the track bed of a dismantled railway or descend into an abandoned quarry. But none of this ever really felt like the countryside. The edgelands are a complex landscape; a debatable zone, constantly reinventing themselves as economic and social tides come in and out. If parts of remote rural Britain feel timeless, then the edgelands feel anything but. Revisit an edgelands site you haven’t seen for six months, and likely as not there will be a Victorian factory knocked down, a business park newly built, a section of waste ground cleared and landscaped, a pre-war warehouse abandoned and open to the elements. Such are the constantly shifting sands of edgelands that any writing about these landscapes is a snapshot. 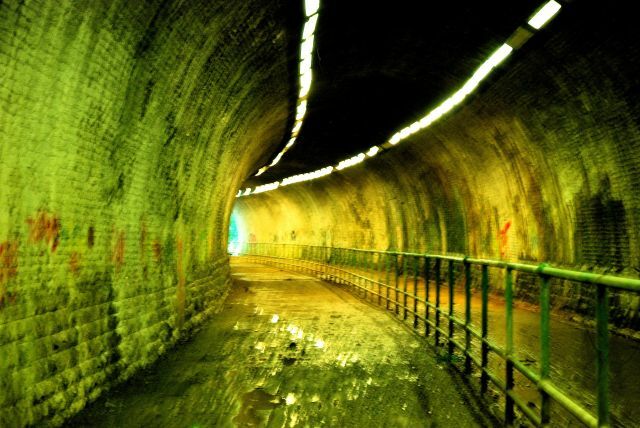 There is no definitive description of the edgelands of Swindon or Wolverhampton – only an attempt to celebrate and evoke them at one particular time. Time and again, we found a place that is as difficult to pin down and define as poetry, but like poetry, you’d know it when you saw it. It often contained decay and stasis, but could also be dynamic and deeply mysterious. Edgelands are always on the move. In our own lifetimes, we’ve noticed how they have changed, largely as a result of the big push for the motorways and the rise of out-of-town shopping, as retailers shifted their operations to the huge floor space and parking opportunities available on the margins of our cities. Such developments tend to perpetuate further development, as infrastructure forms its busy threads of connective tissue, and the course of existing roads is altered, like light bending towards a black hole. As we grew up, the chimneys came down, the slag and spoil heaps were shifted or landscaped and the lay of the land had begun to appear less raw than it had done to another Thirties visitor, George Orwell. In this cooling wake, a less apocalyptically ugly landscape was emerging, haphazardly, beyond the edges of our towns and cities, which themselves were growing outwards in the post-war rush to throw up cheap, high-density housing. But it was a new landscape that made no sense, one with no obvious artistic or literary analogue, no rhyme or reason. At their most unruly and chaotic, edgelands make a great deal of our official wilderness seem like the enshrined, ecologically arrested, controlled garden space it really is. Children and teenagers, as well as lawbreakers, have seemed to feel especially at home in them, the former because they have yet to establish a sense of taste and boundaries and have instinctively treated their jungle spaces as a vast playground; the latter because nobody is looking. Sometimes the edgelands are written off as part of the urban (or suburban) human landscape that has to be escaped, or transcended, in order to discover true solitude in the wilds of northern Scotland, or on the fringes of our island archipelago. At other times – as in the work of some so-called psychogeographers – they are merely a backdrop for bleak observations on the mess we humans have made of our lives, landscapes, politics and each other. 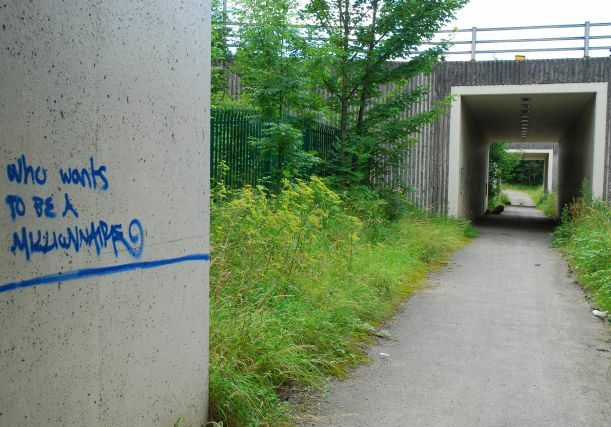 In our view, both these “schools” run the same risk – using the edgelands as a shortcut to nihilism. Most of our cities will contain wastelands just like this, either lying completely fallow or in the process of being redeveloped. It’s always a surprise, walking along a busy street, to find a gap in the shiny advertising hoardings or a bent-back sheet of corrugated iron which affords a view on to an open wasteland carpeted with flowers in summer, or the archaeological earthworks of new building work where foundations are being laid. The city – suddenly – has a new scale; an underness and overness – and the eye is overwhelmed. 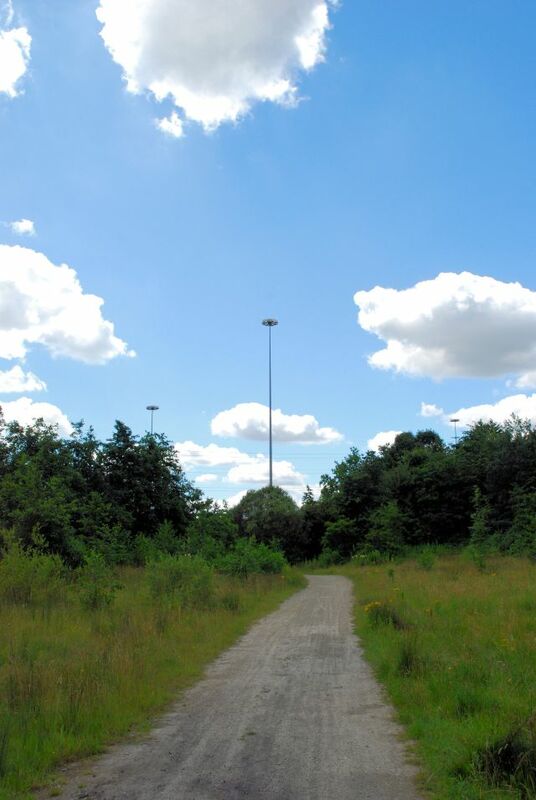 The journey to a high moor or heath in search of wilderness and communion with nature involves a slow readjustment in terms of scale and space, but a city wasteland is all the more mysterious for the manner of our encounter with it: the imagination does the travelling. Strangely, I found a greater diversity of plant life in this short stretch of wasteland than I had along the river bank in the Goyt valley. 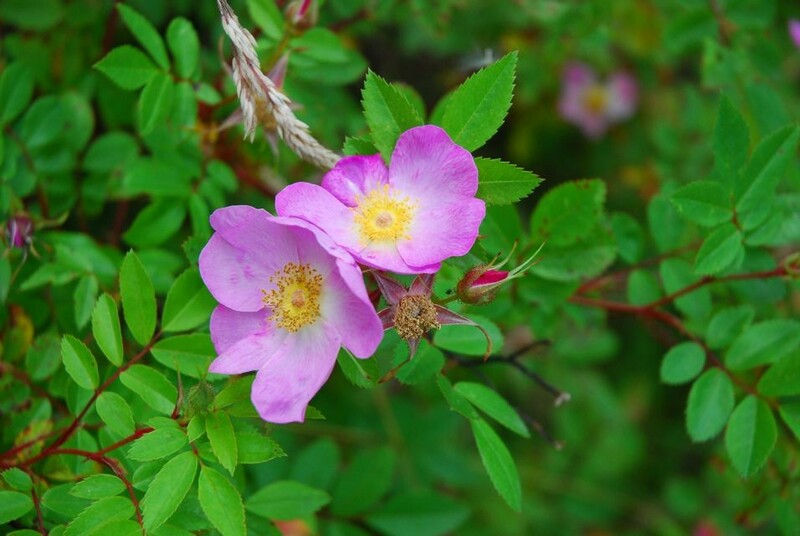 There was Dog Rose, valued in former times for its fruit, high in antioxidants and vitamin C and used to make syrup, tea and marmalade and to treat colds, scurvy and diarrhoea; there was Meadowsweet, once strewn on floors to give rooms a pleasant aroma, used to flavour wine and beer, and, having medicinal properties, as a traditional remedy for an acidic stomach. 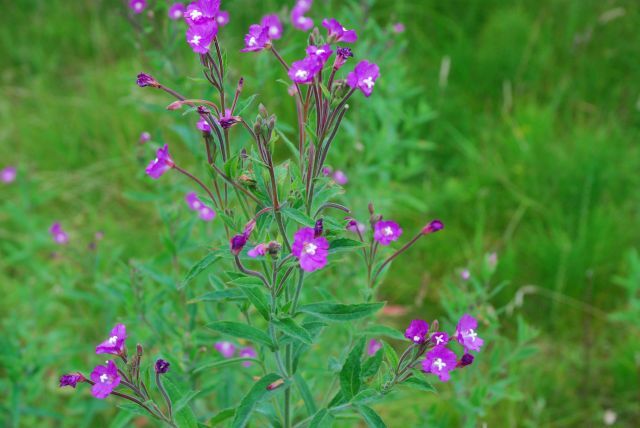 Here were stands of Great Willowherb and patches of creeping Tormentil, both plants which our forebears would have utilised for their medicinal properties – the former, with its with anti-inflammatory properties, applied to wounds, while the latter had uses as an astringent in treating diarrhoea and as vegetable dye to dye leather red. 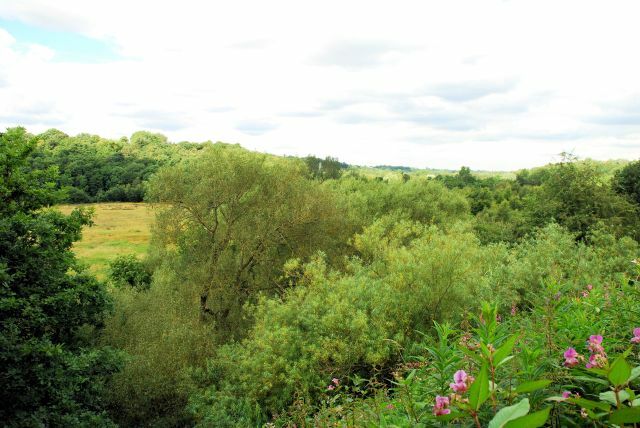 Emerging from this edgeland landscape, the way now took me through a short section of Reddish Vale, through which flows the river Tame. Reddish Vale Country Park opened in 1985, an area of former wasteland that provides a green corridor linking Stockport town centre with Denton in Tameside at the north and Woodley to the west. 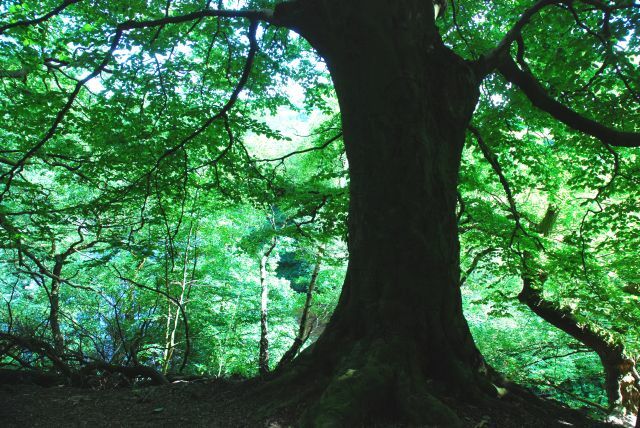 There are walks that link with the Goyt-Etherow, Saddleworth and Longdendale trails as well as the Midshires Way and Transpennine Trail. The Visitor Centre is sited where a former calico printing works was supplied with water from the river via mill ponds and reservoirs. Now, sand martins and kingfishers nest in the river banks. 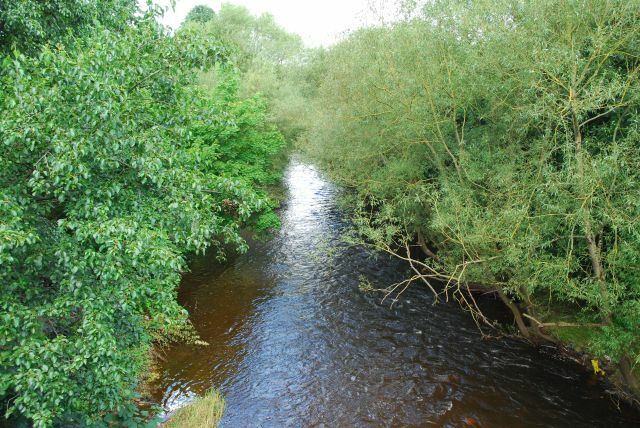 The Tame leaves the Country Park and heads towards the confluence with the Goyt, just beneath the M60 motorway. This is the confluence that makes the Mersey. It is a significant but far from beautiful spot. 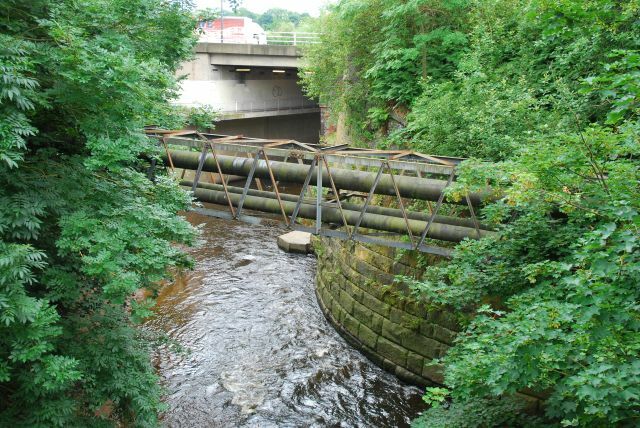 Supermarket trolleys mark the last yards of the Goyt; the Tame limps in under a utilitarian bridge bearing the M60. 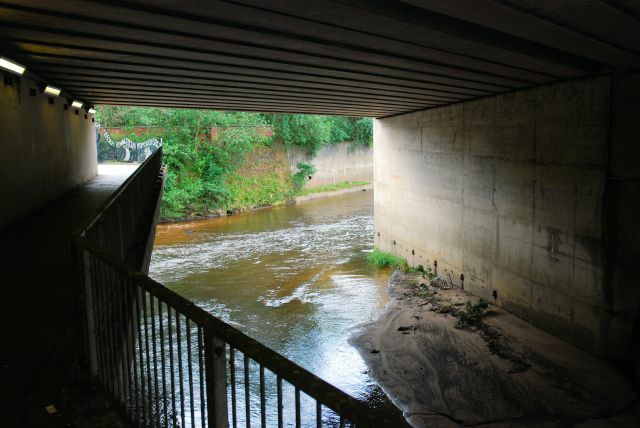 The two waters meet with little ceremony and are brutally bent by the motorway embankment round the back of Sainsbury’s. The young river is then shoved out of sight and out of mind under a branch of Barclay’s bank. This is not how a mighty waterway should begin. 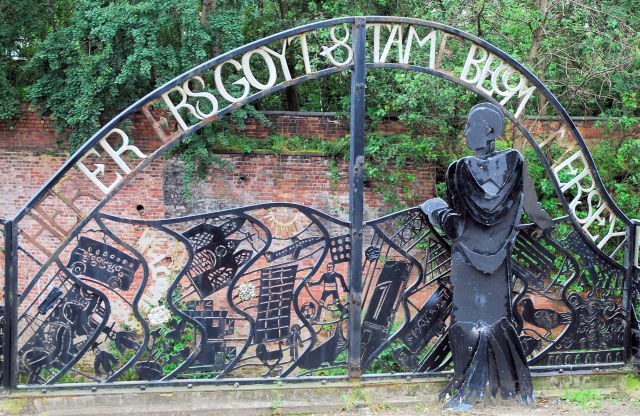 The work was placed here in 1994 as part of a project by Mind Stockport and the residents of the nearby Lancashire Hill district. The piece incorporates depictions of Victorian mills and the birds and other wildlife found along the river. There is a fisherman, a football player (presumably a reference to Stockport County FC) and an aeroplane. This might be a reference to the planes that, every three or four minutes, file past directly overhead as they descend on the flight path to Manchester airport, 6 miles away (or it may commemorate the air disaster in 1967 when a plane crashed in the town, killing 72 people. Stockport’s distinctive railway viaduct is depicted, and hats represent the town’s long tradition of hat-making. Buildings in the town, such as the Victorian market hall, the long-gone castle, and the bus station are shown, while two tennis rackets refer to Fred Perry, a native of Stockport and the last Englishman to win the Wimbledon title. The traffic on the M60 thunders by overhead, as the river that is now the Mersey flows round a bend. Its course, for the first half mile or so, will be underground. But, before I pursued that thought, I needed a pint and some lunch. I chose to call in at one of the town’s most historic pubs, the Arden Arms, an early 19th century coaching inn on Millgate. I ordered a hot brie, cranberry and rocket panini (they didn’t serve those around here when I were lad), and to go with it, a pint of build a rocket boys bitter, supposedly ‘created’ by my favourite British band, Elbow. It was a fine brew. The ale was created in partnership with Stockport brewers, Robinsons, and helps raise money for Oxfam’s East Africa appeal. 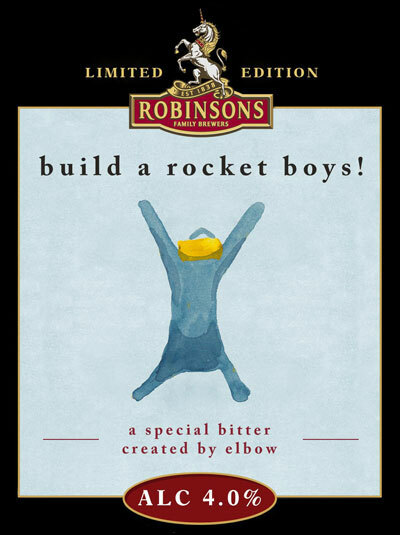 Elbow and Robinsons have pledged to donate a significant percentage of all profits raised by the sale of ‘build a rocket boys!’ beer to Oxfam’s appeal, launched as millions of people in East Africa face desperate food shortages following the worst drought in 60 years. Across the region, Oxfam’s emergency response is reaching 2.9 million people, providing clean water, seeds and tools, and helping repair infrastructure. The Good Beer Guide describes the Arden Arms as ‘Grade II listed and warranting a visit for the building alone’. The coaching inn was built in 1815 in late-Georgian style and retains its character to this day, both inside and out. 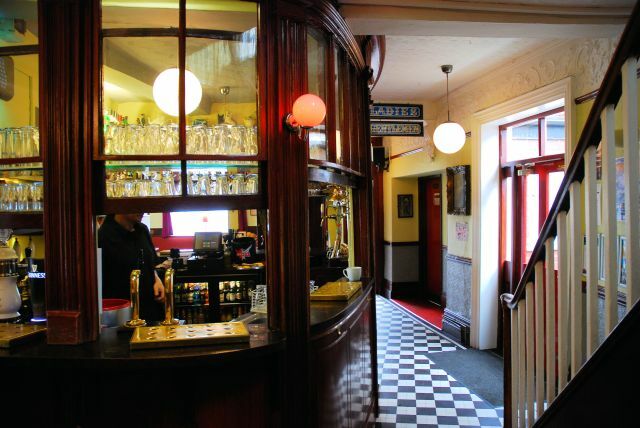 In fact, it’s one of only 250 pub interiors — of 60,000 around the country — to appear on the CAMRA National Inventory as being of outstanding heritage interest. 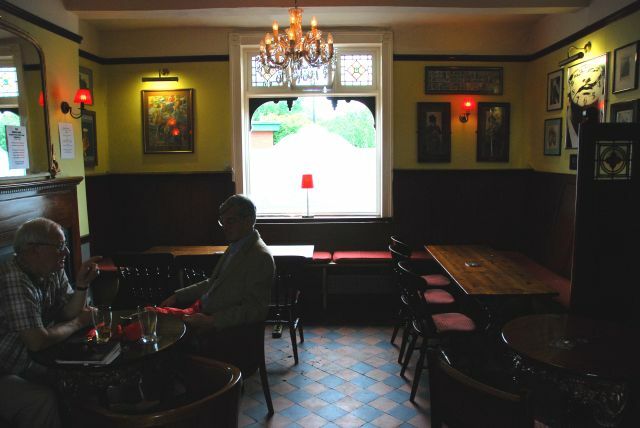 There’s a fine bar, a tiled lobby, a grandfather clock and several traditional rooms, including a splendid snug. In winter there are coal fires. The day was warm and close, so I went outside where the cobbled courtyard has been turned into a beer garden. 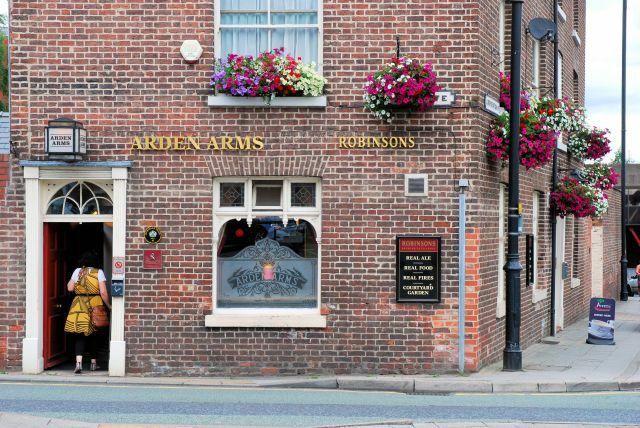 The land on which the Arden Arms stands was originally a market garden owned by the Raffald family, who had been florists, gardeners and seedsmen in Stockport since the sixteenth century. In 1760, John Raffald handed ownership of the garden to his brother, George Snr. and took up the position of head gardener at Arley Hall in Cheshire where he met Elisabeth Raffald and married her in 1763. It was John and Elisabeth’s nephew, George Raffald Junior, who built the present pub in 1815. In return for ceding a portion of field to the town to widen Millgate, then a narrow ditch between buildings, he was granted the right to build a larger public house in the contemporary late Georgian style on the site. 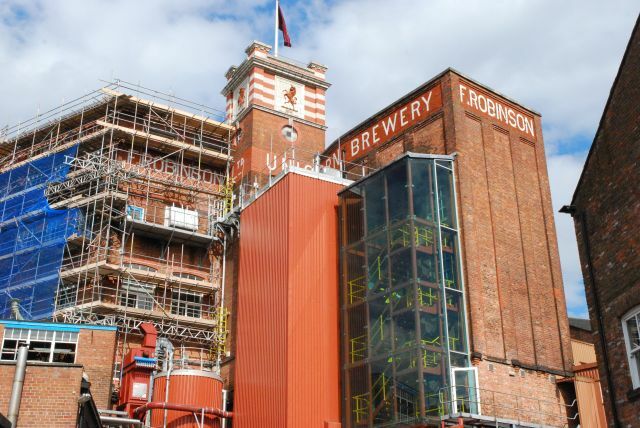 In 1889 the Arden was bought by Robinson’s, who still brew great beers at their brewery just a stone’s throw away. It was the beer I was weened on as a teenager in Poynton. Fed and watered, I ambled around town, noting the changes since I last walked these streets as a teenager, and the historic architecture that probably passed me by in those days, when Stockport was just about the nearest place to go to the cinema, and was best known for its modern shopping precinct, Merseyway. 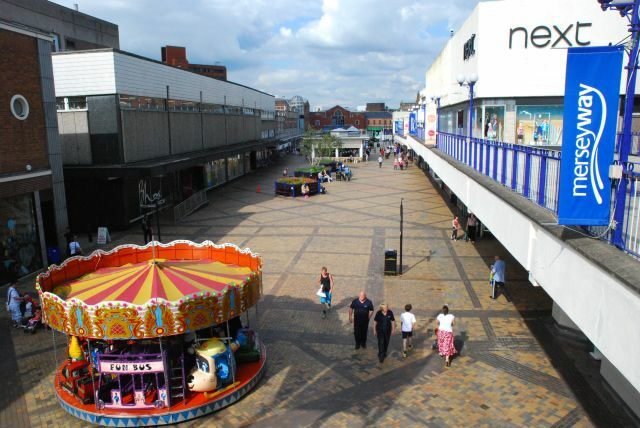 This view of the Merseyway closely approximates the course of the Mersey – for the shopping centre is built on concrete columns which rise from the riverbank. 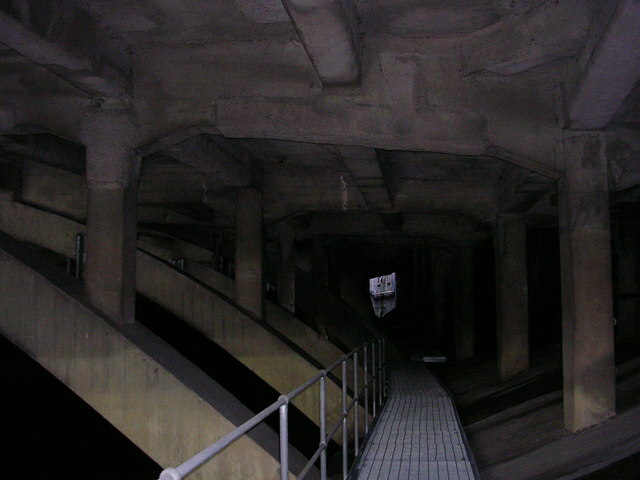 The walkway in the photo below runs the length of the riverbank beneath the precinct. 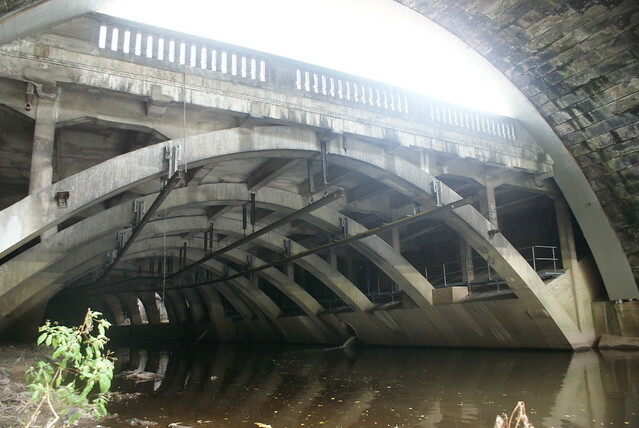 There are some more photos by Paul Powers of what it looks like underneath Merseyway here, with more here, a page which also features an old photograph of Lancashire Bridge, improved and widened in 1881, but subsequently hidden when the Mersey was culverted in the 1930s. The river emerges at the western end of Merseyway, seen here in this photo by Paul Powers. 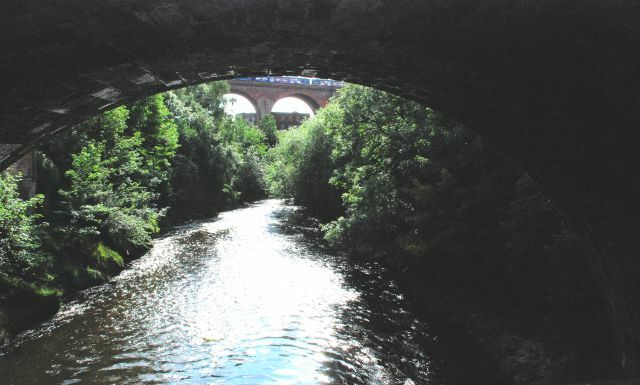 Standing at the end of Merseyway (on the old Lancashire bridge, though you can’t see it), I took a photo (below) of the Mersey emerging from beneath the town before flowing under the A6 to Manchester and then, in the distance, under the arches of the railway viaduct. That’s where I’ll resume this walk next time. Gosh what a ramble, I felt footsore just reading it! :) Tame is presumably the same place name as Thames. No-one seems to know what it means but I wonder if it means ‘teeming’? 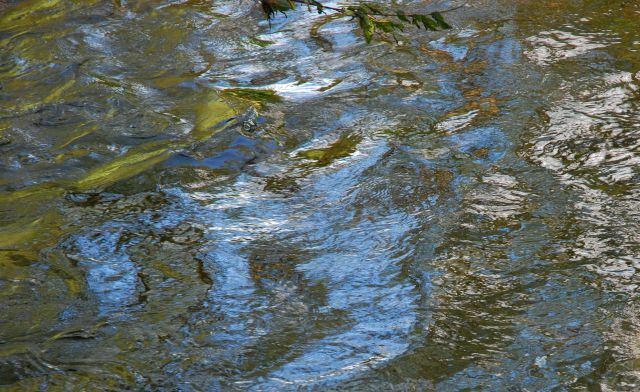 Where two rivers meet is a ‘water-combe’ because the river surface tends to dip as it eddies. That spot possibly had a coombe place name in Brythonic times, perhaps a bit like Kimmeridge today in Dorset, a village one mile south of the river Corfe teeming with confluences? I think it’s another of those instances of tautological naming that was the subject of a correspondence on The Guardian letters page recently. 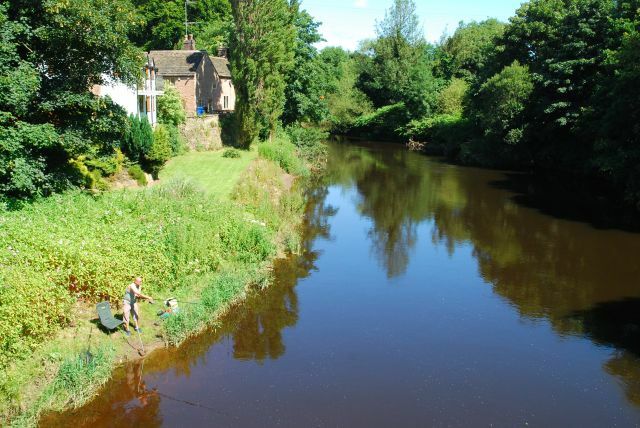 Like ‘afon’ (Welsh) or ‘avon’ (Old English) (so ‘river avon’ means ‘river river’) the name Tame is attached to rivers across the UK in several forms, including Thames, Thame, Taff, and Tamar, and most likely simply means ‘river’, from Celtic origins. So another example of ‘river river’. Great blog, I enjoy your style Gerry. My appetite for fishing this morning is very much whetted, just need to pick a river now. 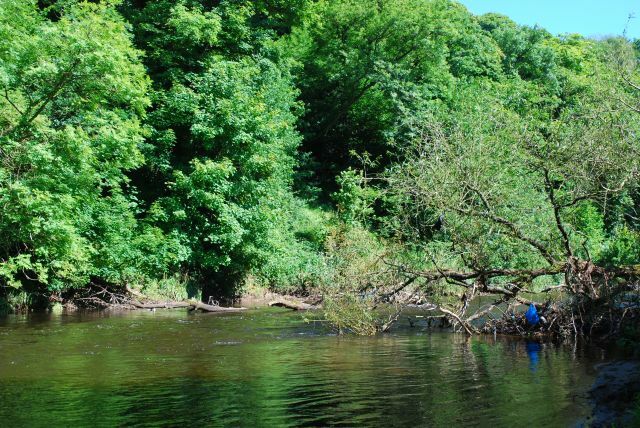 I happened upon this wonderful blog completely by accident when searching the river Goyt. It re-awakened my time growing up in the 1950s and early 60s on the edge of Woodbank Park where the bluebells create a shimmering carpet each May followed by a short season of leather on willow at Offerton Cricket Cub. Happy days long ago when one Sunday morning I met Bobby Charlton, about 1960, who with Shay Brennan and Bob English came to watch the amateurs playing football on Woodbank Park meadow. My father, still alive aged 97, tells stories of Fred Perry playing tennis on the public courts of Vernon Park in the early 30s. He spent the war years building aircraft in Stockport, possibly the reference to the towns industrial heritage along with cotton and hatting. 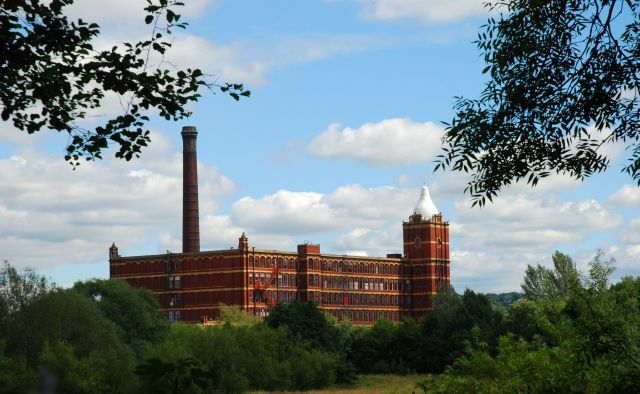 I walked past Battersby hatting works on my way to primary school in the mid 50s. It was still in production. An almost unbelievable coincidence re: your quoted reference to Edgelands, I occupied the next office to Marion Shoard at the Centre for Environmental Studies in London in the mid 70s. Thanks, David, for your generous comment and your memories of the Goyt- and that coincidence, too! Dear David. I found this blog not only extremely interesting but deeply moving. I moved away from the north of england in 1980 and have recently been attempting to write down my memories of my 1950s childhood. The disappearing industrial landscape is entrenched into my memories and your writing and photographs are so inspiring. I am so glad that someone more gifted than I is writing so beautifully of these times and places.